When you think of Seattle, cheesy movies, the Space Needle, Coffee, and Pike Place Fish Market might be the first things that come to mind. But did you know Seattle is also home to the Pacific Science Center? The Pacific Science Center began as the United States Science Pavilion during the 1962 Seattle World’s Fair. Millions came to explore the wonders of science during the World’s Fair and upon closing ceremonies, the Science Pavilion was given new life as the private not-for-profit Pacific Science Center, becoming the first U.S. museum founded as a science and technology center. This is where we find and Spotlight Tony Smith, the Adult Coordinator for the Teen Science Café Seattle program. The Seattle Teen Science Café is in its 4th year. We hold programs almost every month alternating between here at Pacific Science Center and a teen center in Redmond, WA to the east of Seattle. I’m not sure how unique it is, but our Teen Advisory Board is broken down into four committees: Marketing, Hospitality/Logistics, Content, and Activities. Each committee has a Committee Head who makes sure their committee gets its part done. The other Board Members rotate around to different committees each month to try out different tasks. We have an Advisory Board Leader who oversees all the communication with the Board, coordinates with all the committees, and leads our meetings. Teens who have been on the Advisory Board in the past apply for and then interview with me for that position. My background is in science education. I was going to be a middle school science teacher (still might someday) but discovered the amazing world of informal science education through an internship I did after college at the Oregon Museum of Science and Industry in Portland, OR, and working at the Outdoor School, a program for 6th graders. They spend a week in the woods with their class from school learning natural sciences from high school. I mentored the kids, along with volunteers and other adult staff. I later was hired to full time staff at OMSI, primarily teaching with their Outreach and Travelling Programs in local schools. I had the opportunity to also work with OMSI’s Teen Science Alliance, working with teens to build leadership and facilitation skills. When I moved to Seattle a little over a year ago I was hired at Pacific Science Center in the Portal to the Public department, and one of the projects I was assigned to was Teen Science Café. 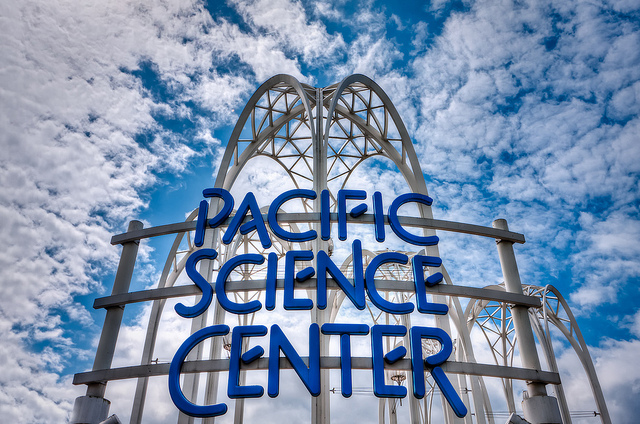 The Pacific Science Center is an independent, non-profit science museum based in Seattle, Washington. The center’s original buildings were the United States Science Pavilion, part of the 1962 World’s Fair in Seattle. The Pacific Science Center is host to the Teen Science Café Seattle. The Seattle Teen Science Café is run through Pacific Science Center. Our mission is to ignite curiosity in every child and fuel a passion for discovery, experimentation, and critical thinking in all of us. I think that the Teen Science Café model accomplishes all of those things very well. Perhaps most importantly, the Teen Science Café provides a space for teens at PacSci in a way our other teen programs that require high commitment don’t. Specifically Teen Science Café is open to any teen that wants to attend. This year, even though it is our fourth, has seen some of the lowest attendance numbers so far. It is hard to say what is causing that, but our Teen Advisory Board has been working very hard to come up with new ideas for marketing. They are specifically ramping up the social media. This past October we had a café delivered by a local neuroscientist who spoke about the neuroscience of zombies. She framed it as a real event and that the talk would be to get the students the information they needed to effectively fight the incoming zombie horde. Her presentation of real neuroscience and what classic zombie symptoms would be caused by was well done. 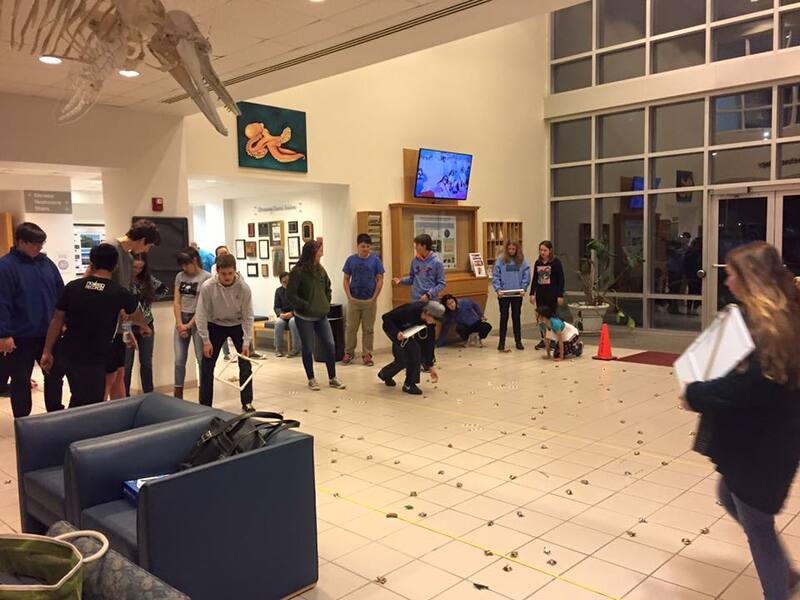 For the activity portion of the night the group played zombie tag, learning about how diseases spread. After the first round the speaker introduced a “vaccine” where if a healthy person was “infected” they would have to go roll dice to see if their vaccine was effective or not. Everyone in attendance really enjoyed the event. I really like that it provides a place for teens to be nerdy and express their interests without fear of being judged or ostracized. I also really like that all the decisions are made by the teens themselves, and that they are empowered, rather than being told by adults what to do. When things don’t go well we talk about it later and discuss what we are going to do differently next time. As hard as it can be for you as the adult advisor to let your teens fail, that is one of the most powerful parts of this program. If you step in too much they become reliant on you and it can stunt their creativity and problem solving. I would also suggest being sure to provide time for your planning leaders to get to know each other and facilitate team building.